needed to know more. Op Ed is, of course, an opinion. But I am not sure if Mr. Dambach is speaking only for himself or if he is also, somehow, speaking for the NPCA. Senate Bill #2667 and H.R. #4979, the Peace Corps legislation pending before Congress, outlines how funds for RPCV activities are to be dispensed. Section 10 states that Ò the Director of the Corporation for National and Community Service shall award grants on a competitive basis to private nonprofit corporations...Ó The authors of the legislation rejected the notion that one agency and/or the NPCA be given a monopoly. 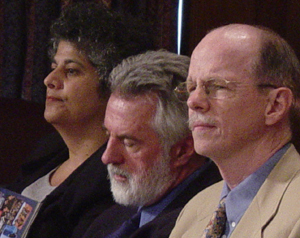 The President of the NPCA, Dave Smith speaking before Congress on June 25th, 2002, pledged the support of his organization for Senate Bill #2667. He asked for no changes. So, if Mr. Dambach is speaking soley for himself, he is at odds, not only with The Peace Corps Fund, but also with the NPCA, the organization which he proports to support. If, however, Mr. Dambach is somehow speaking for the NPCA then, this represents a change from what was said to Congress. Because of Mr. Dambach previous long association with the NPCA and his advocacy for that organization, I think it is critical to clarify for whom he speaks. I respectfully request that either Mr. Dambach or Mr. Smith or both, issue such a clarification. Thank you. I am very happy to respond to the questions raised by Ms. Roll. I appreciate her interest in the issues and her questions. 1. The op ed article was entirely my own, and did not intend in any way to reflect the opinions of the NPCA. 2. I understand, appreciate and support the legislation that is under consideration. 3. My problem with the Peace Corps Fund is not that it would establish an organization other than the NPCA that might be eligible for funding through the Corporation for National Service. There are several organizations that could easily become eligible for those funds. My problem is with the name "Peace Corps Fund" and with the tactics used by the leaders of the organization to build support. I have received many phone calls and email messages from people who know the issues, and they have been very enthusiastic in support of the position I expressed. I simply hope the Peace Corps community will work together in support of the agency, its director and the NPCA. I also hope the leaders of the Fund will find a more appropriate name for their organization and that they will work in cooperation with the leadership of the Peace Corps and the NPCA. I believe that the Corporation for National and Community Service, once established by the pending legislation, would be the appropriate entity to determine if the Peace Corps Fund is eligible for funds. The Corporation's purpose, remember, is to support, and provide funds for, all RPCV's projects, not just the projects of those who belong to the NPCA. It would seem to be the Corporation that would have the authority and the resources to assure that the Peace Corps and the NPCA work in cooperation with the Peace Corps Fund. If any of the persons who contacted Mr. Dambach with "entusiastic'" support are members of the NPCA or Peace Corps leadership, it would seem the Corporation for National and Community Service has its work cut out for it before it can even be established. "The stated purpose of the non-profit corporation shall be to act solely as an intermediary between the Corporation for National and Community Service and individual returned Peace Corps volunteers seeking funding for projects consistent with the third and fourth goals of the Peace Corps." How will the merits of grant proposals from the "intermediary" non-profit corporations (e.g., Peace Corps Fund) be determined, when it is the quality of the RPCV projects that is paramount? Why is an "intermediary" necessary? That Dambach guy, appreciate your service. I remember you "tabled" and discounted alot of good ideas in the past. and other Peace Corps Veteran groups. If the Peace Corps can't get creative, why can't we as former volunteers? Tolerance Mr. Dambach, Tolerance, there are a world of ideas and organizations that can contribute to Peace Corps and its goals. I write to correct what may be a misunderstanding by Terry Adcock and Peter Hansen. There is already a Corporation for National and Community Service and it includes the so-called Freedom Corps. The new legislation would NOT create a corporation just to fund RPCV projects - rather it would authorize the Director of the existing Corporation for National and Community Service to chose which RPCV projects to fund. The critera for making such a choice is not outlined in the pending legislation. The website for the existing Corporation of National and Community Service is: nationalservice.org. The prohibition against involvement in intelligence gathering activites is not included in Section 10 -where the funding for RPCVs is authorized. There could be up to $2 million annually available to fund the "administrative" costs of these RPCV nonprofits. The legislation would "umbrella" RPCVs into the already existing framework of community programs...whose current focus is homeland security.